Play using a well-adjusted (hopefully) original machine and a microphone in or near the horn. This is fine for once-off playing, and demonstrates the machine's charm, but causes wear to both the machine (stylus & drive-train) and the cylinder itself. Also, mechanical reproduction through most reproducers and horns introduces a "characteristic "sound, due to resonance and linkage movements. Finally, room acoustics can be introduced. The phone could ring! 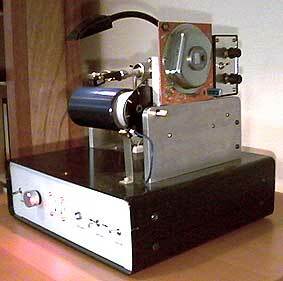 Play using a stereo phono-cartridge adapted to fit into the carriage arm of an original machine. This method has the advantage that the stylus is tracked correctly along the cylinder, and will not "stick" for any great length of time even on worn/damaged grooves. Also, changeover styli may be employed to match the groove geometry. The stereo cartridge wired anti-phase responds to hill-and-dale modulation as used in the cylinders. The only problem with this method is that all the imperfections of the cylinder player's mechanism (wow, flutter, mechanical/gear noise, spring "thumps" and wind-downs) are expressed in the final result. 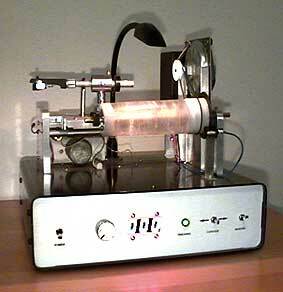 Play using either cylinder player mandrel or home-made mandrel and long tone-arm/stereo cartridge. The long tone-arm approach (I've seen one 3 foot / 1 metre in length) minimizes tracking errors. The limitations of the original machine (see last item) are present, and the stylus is subject to sticking in locked grooves. The long tone-arm also has more mass, forcing the stylus to cause more groove wear. 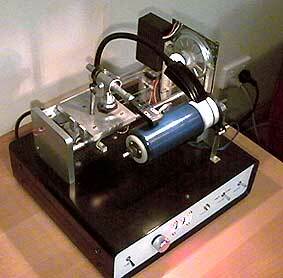 A Do It Yourself machine: It costs a lot to have mechanical parts made, and designs don't "appear" out of the ether. Yet this is my favorite approach. As an electronic/computer engineer I had access to most common machine tools, as well as a sympathetic relative with the metal lathe needed to copy a cylinder mandrel. I chose to design a tangential tracking mechanism to move the cartridge and stylus across the cylinder being played. The raw audio out is passed to a phono pre-amp and then to the PC for recording and noise reduction. "A picture is worth a thousand words"...so I'll keep the waffle down, and show you some pictures! 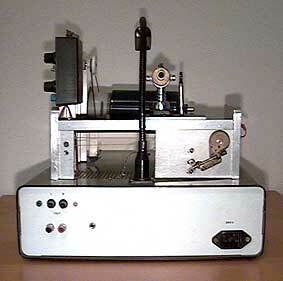 Front view of the player - tone-arm in playback position. Top view with tone-arm in playing position with Blue Amberol on mandrel. The tachometer speed pickup sensor (non-contact) is at the right of the mandrel. The picure above left shows a front view of my player. Toggle switches control "Power", "Carriage Left/Right" and "Mandrel". A two-color LED indicates tone-arm normal (green) and mis-tracking (red). When a tracking error is sensed by a optic-sensor, the arm is moved incrementally (about 0.5 mm "jumps") to the left to correct it, using a taut-band drive. Micro-switches at each end of the carriage travel prevent it from crashing into the ends of the machine, and damage the mechanism. The knob controls the volume for a small internal speaker, if needed. Next to this is the tachometer display which measures mandrel speed +/- 1 RPM over the machine's range of about 60 RPM to 250 RPM. A three step pulley, combined with an adjustable speed DC-powered AC variable frequency drive motor allows any speed in this range to be achieved. 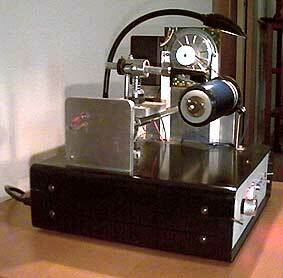 The mandrel itself is made of laminated Perspex, turned on a metal lathe. Dimensions for the mandrel were taken from my own Fireside machine's mandrel. A "DJ" lamp on a flexible gooseneck illuminates the works to assist in cueing the cylinder. 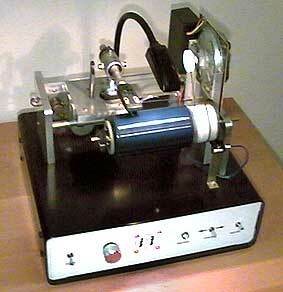 4-Minute Blue Amberol & other celluloid cylinders are played using a standard 78-rpm D5127 Stanton stylus. This is a very close compromise to a custom stylus, and considerably less expensive! 4-Minute Wax Amberols present a challenge; how to play the not-so-strong surface without damaging them. I am at this point in time avoiding any playback on this machine whilst I consult others who have tackled this problem. A custom counterweight and tracking optic-sensor (hidden) under the carriage base completes the tracking components. Another top view with tone-arm in playing position with Blue Amberol on mandrel. The tachometer speed pickup slotted disc can be seen at the right of the mandrel. Left end view showing mandrel bearing and some carriage detail. The optic-sensor under the carriage registers tone-arm mis-tracking in one direction only. Thus the tone arm "falls" from right to left across the cylinder. Flexible cable links the LED/sensor array to the control electronics inside the base. The advantage of a non-leadscrew drive is that shrunken celluloid (and wax) cylinders, with groove pitches which are no longer standard, can be played. The Dictaphone standard of 150 tpi can also be accommodated by such a system. A "nudge" facility to force carriage movement exists, if a locked groove is encountered, but the cost is some extra editing of the WAV file. The tracking motor (a small 6V DC tape recorder motor) is fed via a dual worm gear drive to the taut-band that moves the carriage and tone-arm. Four-way ultra-fine phono cartridge cable links the cartridge output to the upper RCA connectors on the back of the unit. A flat pre-amplifier boosts the signal to line level and this connects to the lower RCA connectors. This allows for ready connection to a PC sound-card for processing of recordings. An external speaker can be connected via the 3.5mm jack, for big-scale playback to an audience! Right end view showing mandrel drive motor and high/low speed range adjustment pots. The slotted disc provides rotational speed information to the digital tachometer circuits. Rear view showing phono-cartridge outputs, and dual worm gear drive for the carriage. Making Use Of It - "Sonic Restoration"
1. Pre-amplification And Equalization: The output from my machine is a low-level (Stanton 500 Mk 2 moving magnet) signal, and is not directly usable. A pre-amp was a must, so I constructed a flat (non-RIAA) pre-amp to bring the signal up to line level and connected to the PC sound card input. Cylinders and all other early recordings were "equalized" by the mechanical characteristics of the system, not to the RIAA curve. 2. Software And Hardware For Audio Processing (2004 update): ...And the whole scene changed. I now use a PC-based system, but most of the functionality applies to Macintosh and Amiga machines. Please don't bombard me with "Mac's are better than PC's"...this isn't the place for such a discussion. Both platforms have their merits and problems. Please note that Trevor Wayne Hill sadly passed away on 2nd July 2005.